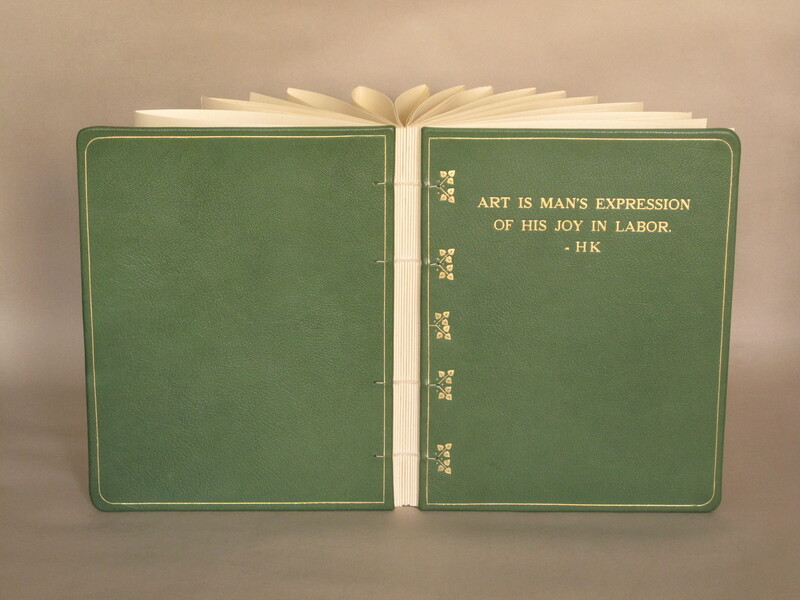 One of the things that keeps me interested in bookbinding is how it encompasses so many different fields. 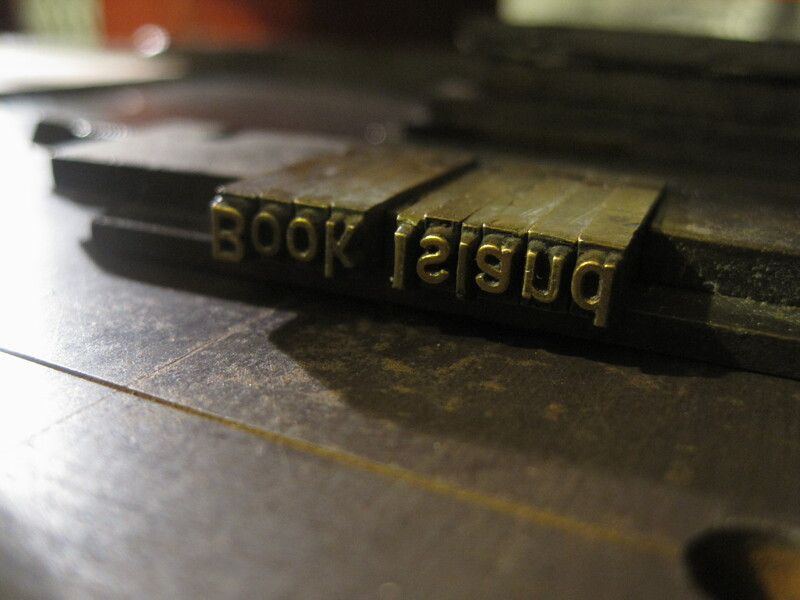 Before working in bookbinding for too long, I quickly realized I needed to learn a little about woodworking, metalworking, tool and die making, fabrics and textiles, graphic arts and typography, materials science, and so on. 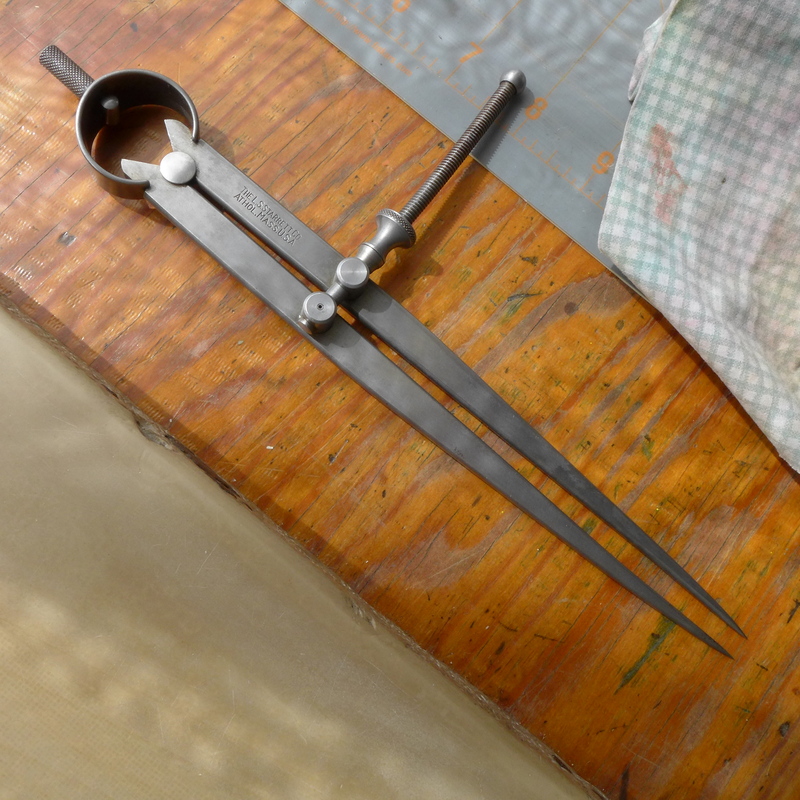 These days (at least, for the past century or so), if you want to do a good job at bookbinding, you need to be able to service your own tools. One frequent question/complaint I hear from my students is about dividers. What are they? Is this a dividers? How about this? Well… those may be listed as dividers, but they’re not exactly what you’re looking for. 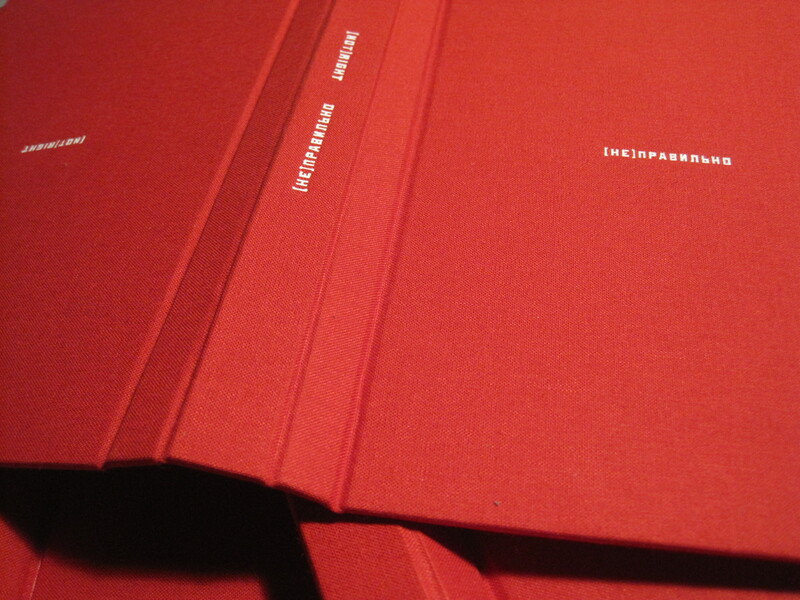 Using a dividers is, to me, one of the more important steps in one’s development as a hand bookbinder. A good set of dividers can make your work more accurate and efficient. It’s important to get the best tool you can afford, and certainly a decent pair of dividers is affordable; you just may have to do some hunting. I have a considerable amount of brand loyalty in this area, and Starrett is the only kind of dividers I like. Though they can be expensive to purchase brand new, it is relatively easy to find Starrett dividers at flea markets and on ebay. The down side is they will often have a considerable amount of rust. Removing the rust is a quick and easy way to make your new find your own. All you need is a little citric acid, some metal polishing compound, and a light machine oil such as 3 in 1. I have seen bookbinders perform experiments in removing rust with Coca-cola (which contains citric acid), but I don’t usually have that around. I do keep some citric acid (available in natural foods stores in the preserving/canning section) on hand for making jam, to balance the acidity of low-acid fruits in order to properly set the pectin. After doing a little web scouting on the topic I turned up this Wikipedia article on pickling metal which I found fascinating, and made me feel a little more confident in removing rust this way. One thing to note is that even though citric acid is safe to ingest, it is still an acid, and how strongly you mix it determines its safety to use. I used about 1 teaspoon for a 9×9″ square pan filled to about 2-3cm deep with tap water. 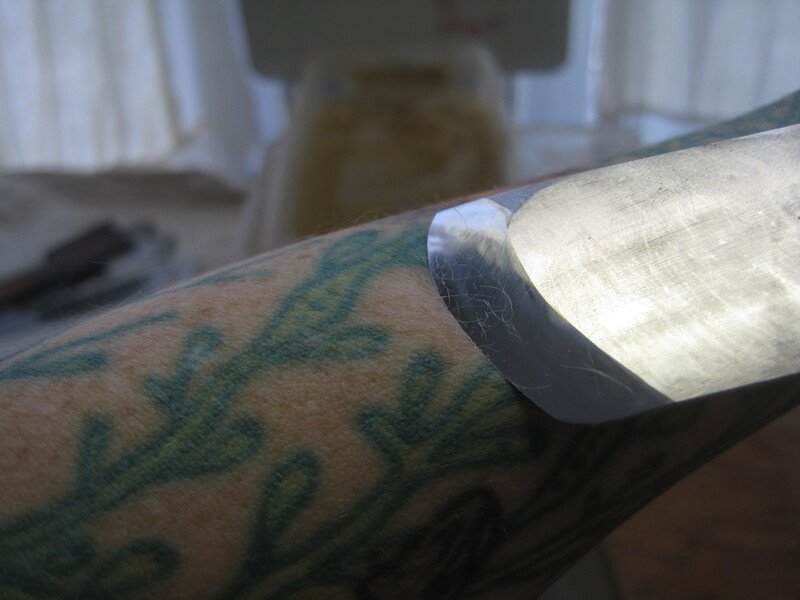 After soaking another hour in the citric acid, then polishing any pitted areas with a metal polishing compound such as jeweler’s rouge, rubbing with a light machine oil, and finally wiping dry. It is a really satisfying feeling to clean up an old tool like this. 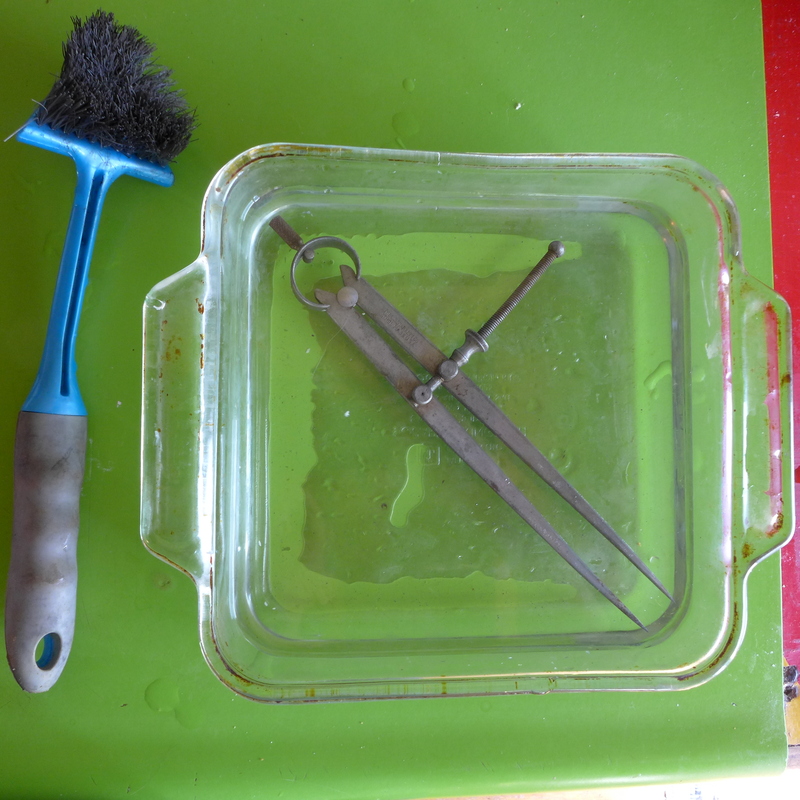 Using a light acid bath instead of scratching away at the metal with a steel wool or brillo pad is much better, in my opinion: the acid removes the rust only, not the unaffected neighboring metal surfaces. 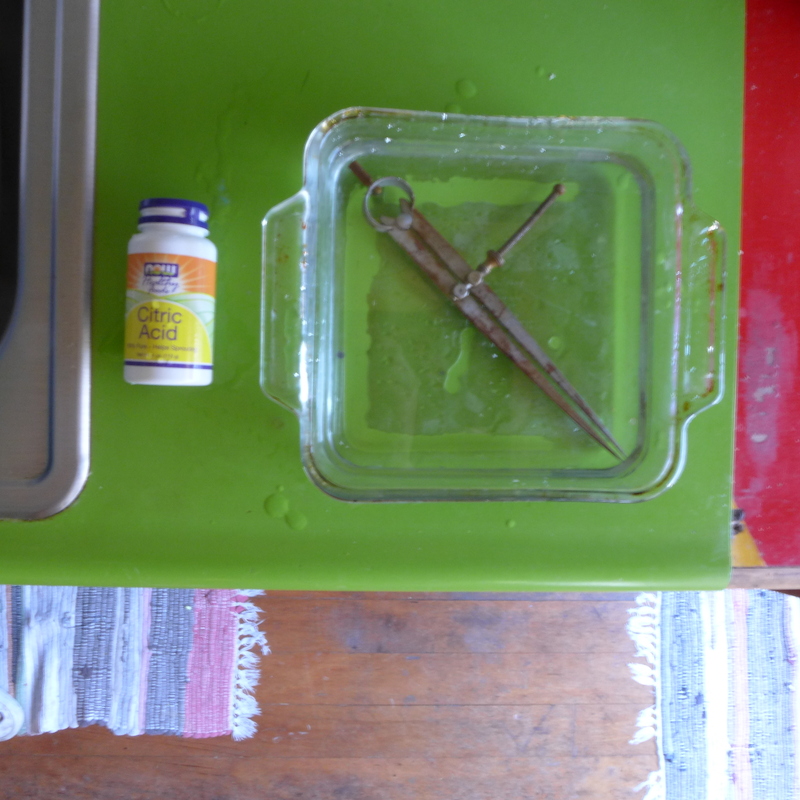 The acid bath also removes rust easily from threaded parts of the tool and other hard to reach areas. Just be sure to dry the tool completely afterward and don’t hold back with the oil. Let the tool stand with the oil on it for at least a few hours at warm room temperature to let it seep in, then wipe it completely clean with a soft cloth. The dividers pictured above now works smoothly and is ready for adventure. 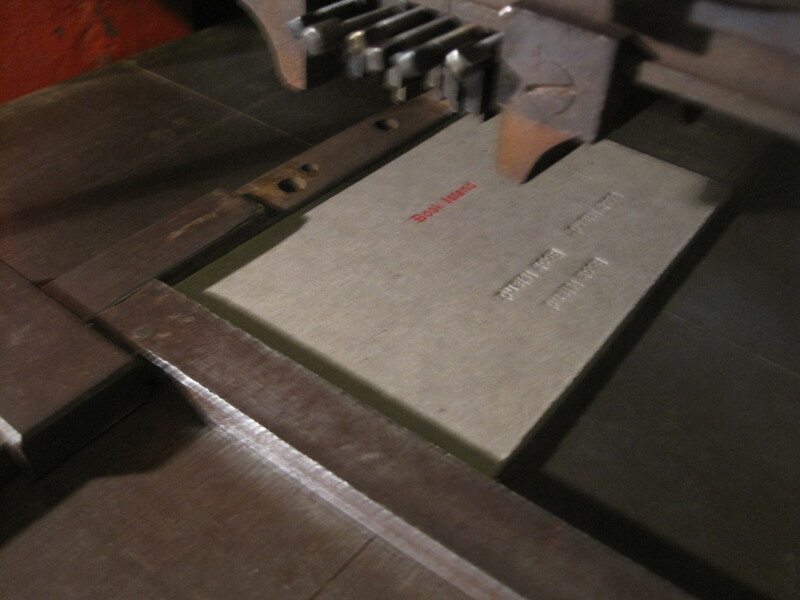 Most of you reading this blog know how much I love bookbinding equipment. One of the special things about this profession is all the extremely specialized tools and machinery we have at our disposal, when we can find it! And usually it seems to take care of itself, once you learn to use it properly. 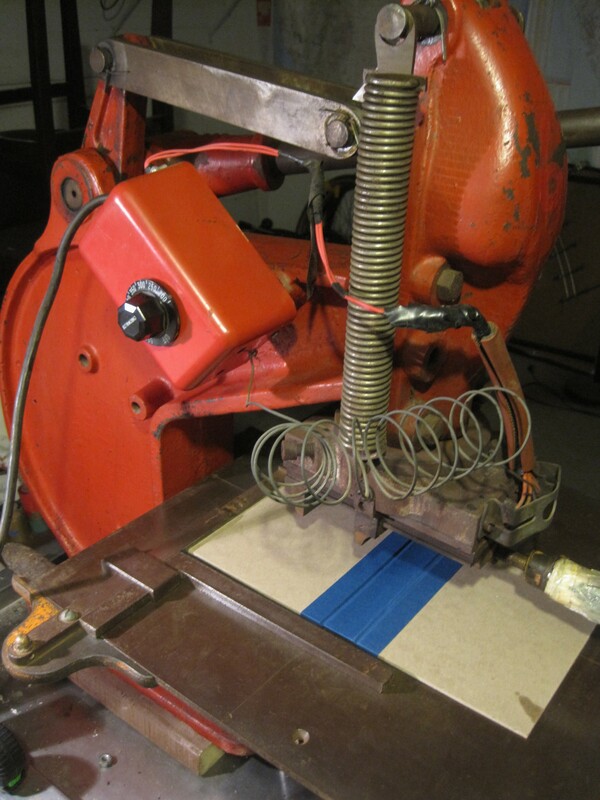 Acquiring a piece of old bookbinding equipment is like receiving a postcard from a simpler time– remove a little rust and a little tape goo, plug it in, and there you have it: a perfectly designed labor saver with steel and cast iron parts machined precisely to thousandths of an inch. Well, finally, it is my time to receive such a gift from the past. This very day with the help of my friends I un-shrinkwrapped a lovely, cherry-red Kensol. It is not (yet) as nice as some I’ve used, better than many others, but at last it is mine. Enjoy some pictures of the new baby and some other examples of titling I’ve done lately. Bright red paint makes it heat up faster! Dos-a-dos (back-to-back in two parts, but bound together) Student Portfolio. The only font available that seemed appropriate was too small and narrow for this large field, so I used large spacers between each letter to make the words take up more space. 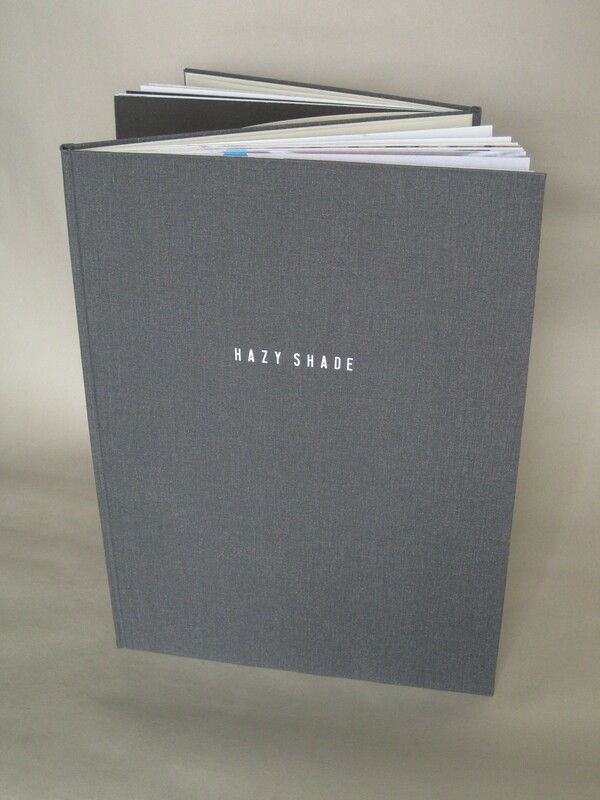 The result is a modern, minimal appearance that complemented the student’s content nicely. These were done with two dies, one in English and the other in Russian. Scarcely 4 mm tall, they had to line up exactly with each other, yet they were upside down from each other. New toys… I mean, new tools! 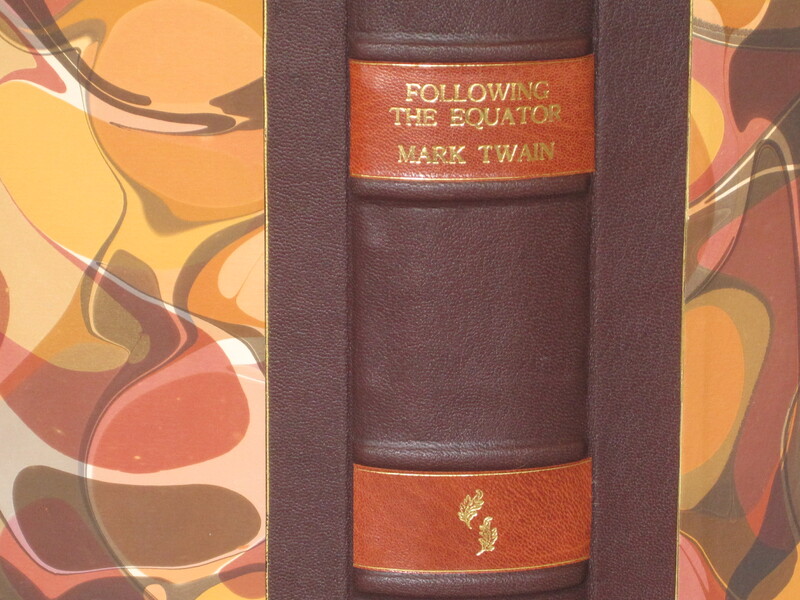 …For new toils. Though I have heard for a long time and from many bookbinders that knives made by Jeff Peachey are sharp and hold their edge well, I have never had the opportunity to test them out myself. As I am a graduate of the North Bennet Street School‘s bookbinding department, I and all my colleagues made our own knives for conservation and leather paring. 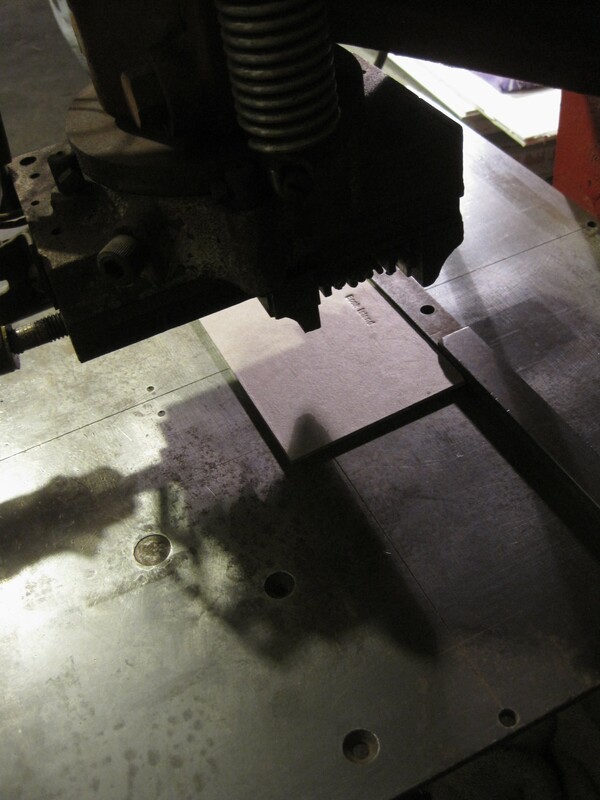 We valiantly (and at times less than valiantly) struggled with it, grinding and honing the traditional way with steel blanks and Japanese water stones. 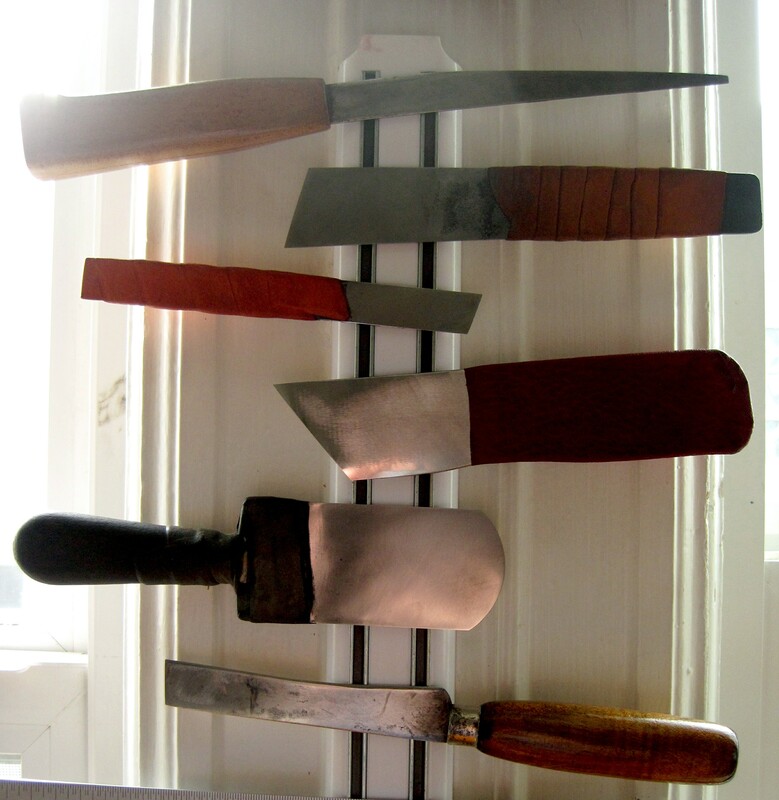 I have used these knives since 2002 when I made them, and they form a cornerstone of my practice as a bookbinder, almost more important than my bone folders! 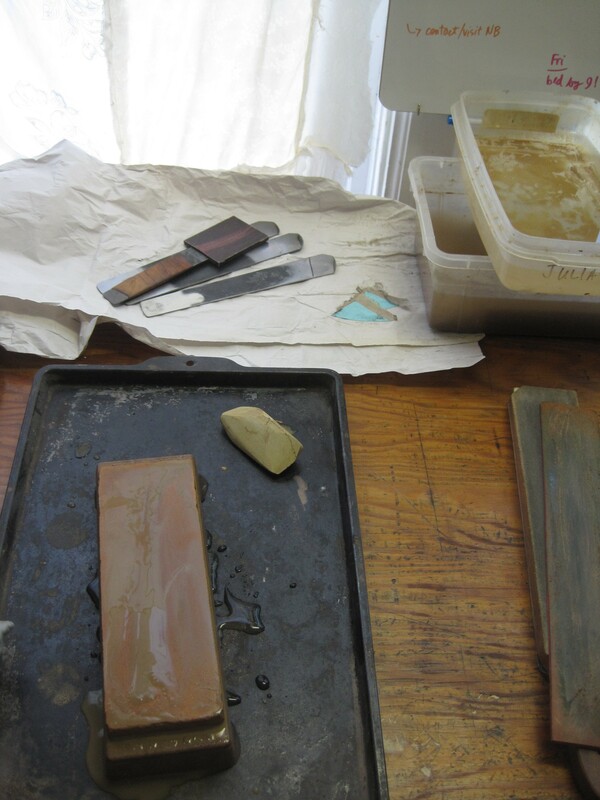 Leather paring knives allow you to reduce the thickness of the leather you use to cover a book, which in turn allows for complex and subtle shaping of the movable parts of the book you are making. Lifting knives, used in conservation, allow you to separate the covering materials of an old book in such a way that when you put them back together after the structure has been appropriately strengthened, the fissure is inconspicuous. Thus, a good set of knives is essential to the livelihood of a skilled craftsperson, and when they’re hand made, knives express even more deeply the expertise and respect with which one practices one’s craft. Right away I can tell I will enjoy using Jeff’s A2 English leather paring knife. The shaft has a contoured shape and is rounded on the edges, which will make it easier to hold through hours of leather paring. The English leather paring knife is different than the rounded French knife I have been using– with the French knife I can pare on either side of a cut edge of a piece of leather, whilst the English knife is limited to paring on the left side. 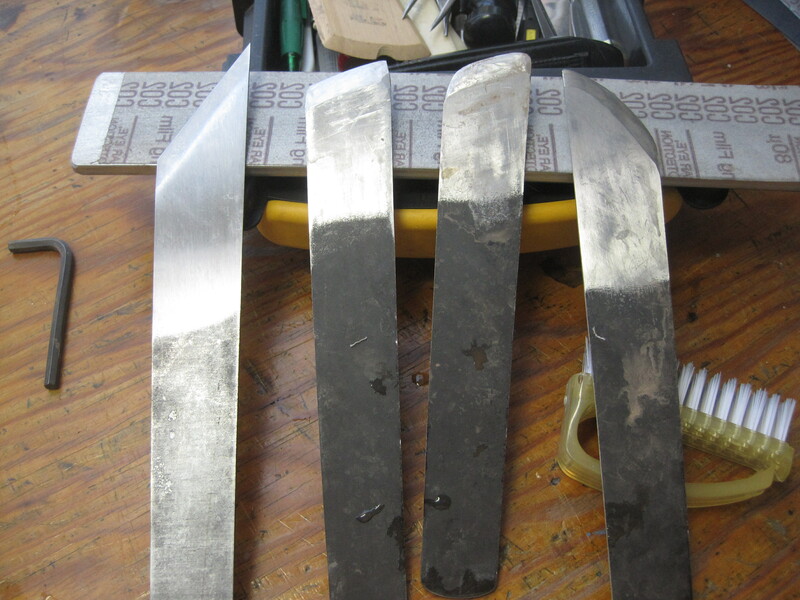 However, possibly because of the straight edge of the English knife, it seems to be easier to cut a broader bevel on the leather, and thus pare large swaths thinly enough to create leather labels and onlays of .1-.2mm thickness easily. I typically use a Brockman for this kind of work, but it’s nice to know there’s another way. 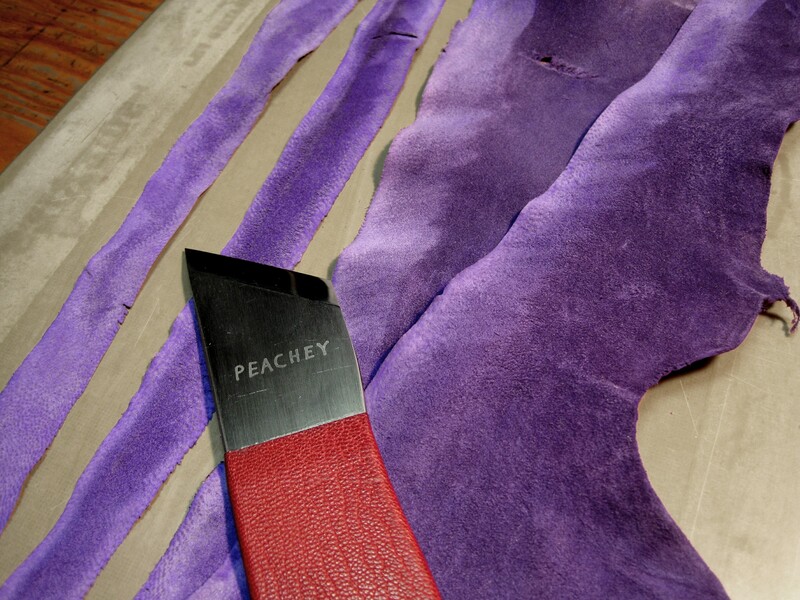 The long bevel would also be useful for the long edges of the new leather introduced in leather rebacks, where a very gradual change in thickness of new leather is desirable underneath a layer of old leather. The A2 steel is quite a bit thicker, and thus heavier than the knives I’m used to. That makes it more tiring on the hand, but I can tell the difference in how it holds its edge during paring. It did need to be stropped once while I edge pared six edges each about 30 cm long, but the leather was fairly stiff, so I thought the knife performed well. This will be a great addition to my happy family of bookbinding knives. From top to bottom: Leather corner cutting knife, lifting knife, small lifting/ board corner cutting knife, Peachey English leather paring knife, round French leather paring knife, dull cobbler's knife (sharpened for paper slitting). They are kept on a magnet so they are close at hand, yet out of harm's way, and the edges never abrade against a sheath. This week I will be making a very large full leather cover for a collection of heirloom photos and ephemera for a local family, so I will have the opportunity to become thoroughly acquainted with my new tool! I look forward to it. If you are interested in looking at some of the other very thoughtfully designed tools Jeff Peachey produces, or would like to read his blog, I have linked to his website on the sidebar to the right.